Day 31 Saturday June 11 "It will go or blow"
I left the marina at 7:15 to drop the car off at Budget in Orillia. Ted picked me up at 8:00 and drove to the marina at Bolsover. We had breakfast at Twigs and by noon Ted had reinstalled the transmission. As he put it "It will go or blow". We started up the engine and it worked. What a relief! We got a pump-out, put the dingy back on the deck and left for Orillia at 2:00. There are five locks before Lake Simcoe. At the third lock we had to wait as the bar that opens and closes one gate had broken loose. The lockmaster was crouched under the walkway sitting on the gate fixing it. It was soon fixed and we went through. 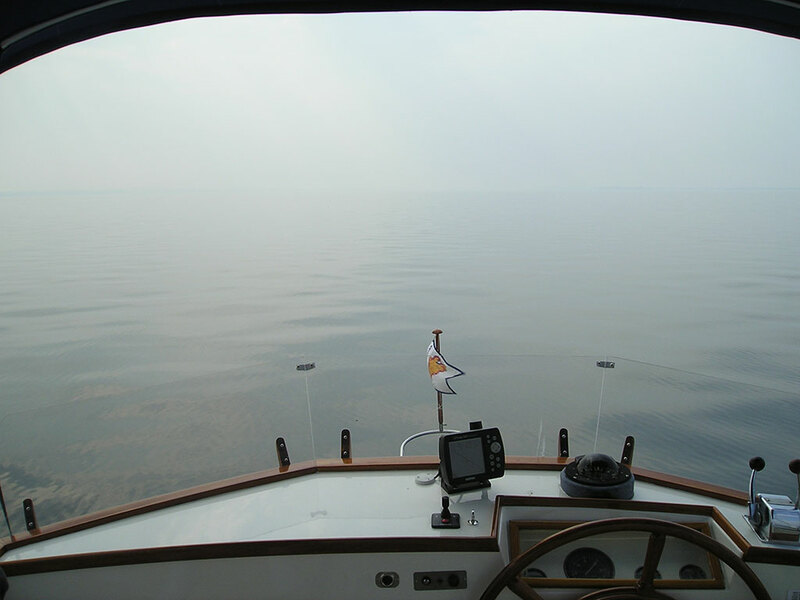 Lake Simcoe was very smoggy (see photo) but calm and the thunderstorms held off until we got to Orillia where we had a dandy storm with lots of rain to wash off the dust that had accumulated over 12 days at Bolsover. When the rain ended Ted and Ethel showed up with a bottle of wine to celebrate the successful repair.